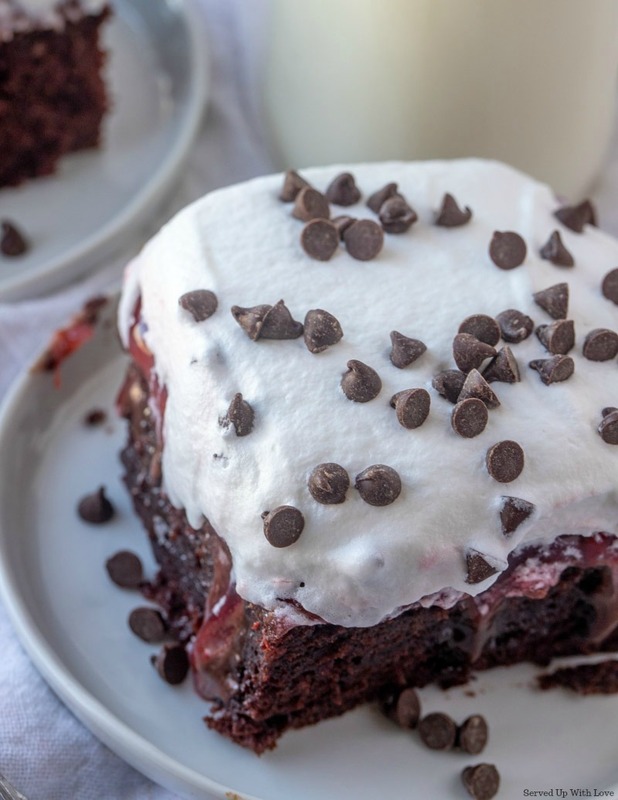 When chocolate and cherries come together something magic happens. This Black Forest Poke Cake is a fan favorite. The idea of this poke came to me while trying to come up with a cake for my son's birthday. It's a twist on our favorite Cherry Brownie Trifle. Birthdays around here mean you get to choose your cake and your birthday dinner. The funny thing is, it is hardly ever the same from year to year. So I start to ask at least a week or two before so I can plan. 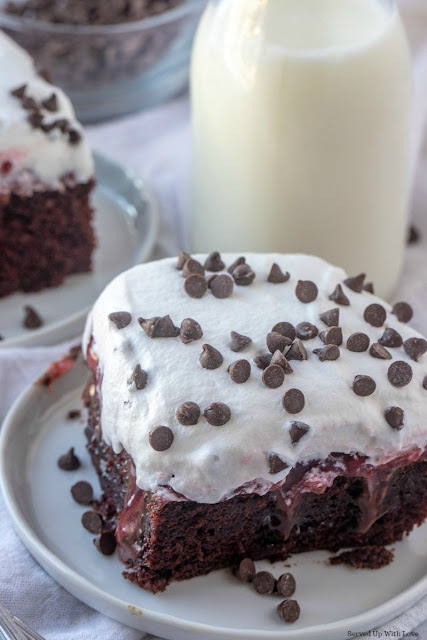 The only request I could get out of him was something with chocolate and cherries...and it was the day before his birthday! So I needed something quick and easy to make without a lot of fuss. I have no problem using a boxed cake mix to save me some time when I need it. A poke cake was the way to go and everyone loved it. 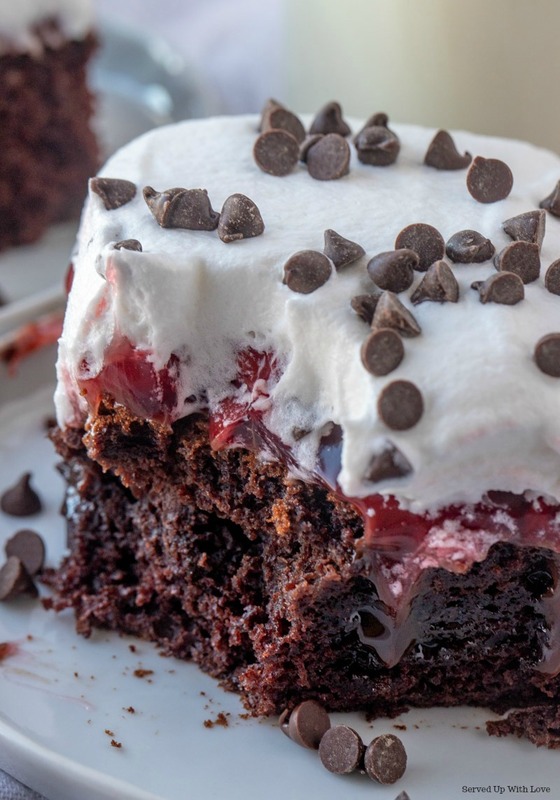 This cake starts off with a devils food cake mix. You can't go wrong there. But the magic happens when you add all the extras. 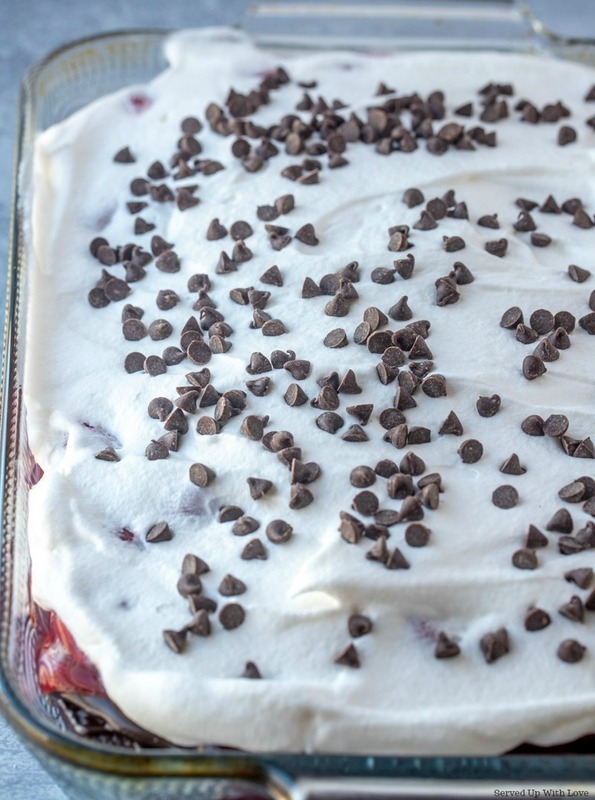 While the cake is still warm, poke holes all over the top with a handle of a wooden spoon. Then let the fun begin! 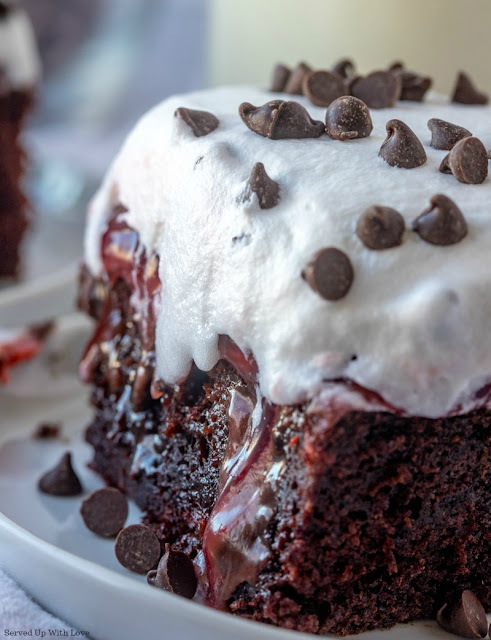 For this cake, I heated a jar of hot fudge sauce and poured it all over the top, making sure to get all that warm hot fudge all in those holes. Then spread a can of cherry pie filling over the hot fudge sauce. I may have made sure a few of those cherries fell into some of those holes. 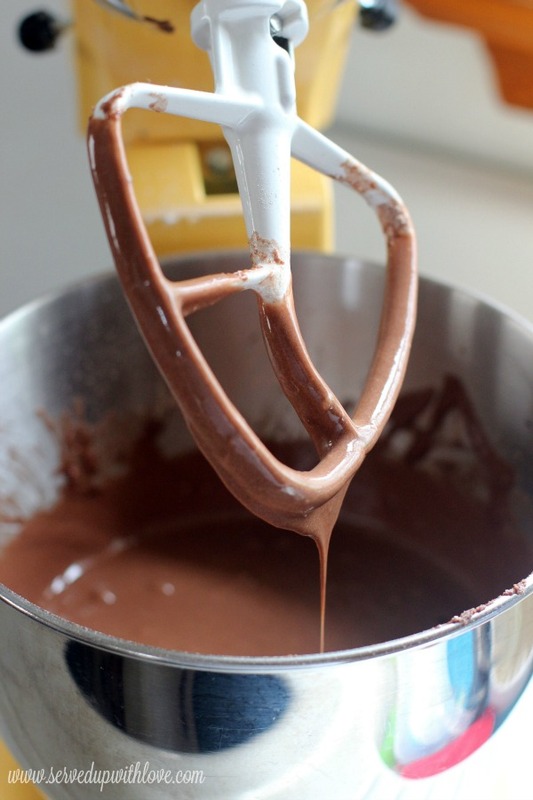 Then add a layer of whipped topping with a sprinkling of mini chocolate chips or chocolate shavings on the top. This cake was a winner for the birthday boy and for this Moma because it was easy! I am not sure how the years go by so fast but he was quick to remind me that I do not have a teenager anymore. Well, that is for a least another couple of years when our youngest hits the teenage years. An old school poke cake with chocolate cake, hot fudge sauce, and cherry pie filling. Simply magical. Make cake according to package directions in a 9 x 13 pan. Let the cake cool for about 10 minutes. Then poke holes all over with the back of a wooden spoon. Place the hot fudge sauce in the microwave for 1 minute and pour over the cake, making sure to get into the holes. Spread cherry pie filling all over the top of the hot fudge sauce. Lastly, cover the top of the cherry pie filling with whipped topping and sprinkle chocolate chips or chocolate shavings on the top.